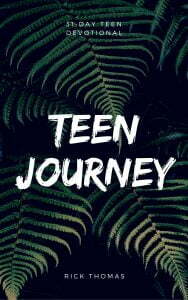 Teen Journey – A 31-Day Teen Devotional – (10,000 words) – This devotional is for any teenager who wants help for what’s happening in their life today and some guidance for their future. It is practical and relevant. You can immediately apply these biblical truths to your life and begin transforming. The ideas in this book are some of the things Rick learned through a lot of trying, failing, and, finally succeeding. He desires to come alongside teenagers, hoping to provide for them something he longed for during his teen years. You will find this book helpful, personally, as well as a great gift idea for that teenager in your life. It would make an excellent individual or group study.